Early colonists of the North American continent had a fairly simple life. The typical immigrant from England had only three things on their mind: where to get food, how to secure shelter, and when would they get their next beer. The most enduring picture of Englishmen coming ashore is the Pilgrims braving freezing surf to land at “Plymouth Rock”. Well documented is their selection of this landfall not by choice, but based upon a dwindling beer supply. They, like those at the other new settlements set their first priorities on survival. With lean resources why did one group after another erect a brewhouse as one of their first structures? It was quite simple. They were Englishmen, and though they had ranged far abroad their thoughts, customs and habits never strayed far from home. Therein lies the answer. Nearly every citizen of the day knew that drinking water could make you deathly ill. Ale drinkers were somehow spared this affliction and therefore most people soon substituted a frequent imbibing of ale over the dreaded curse of water. 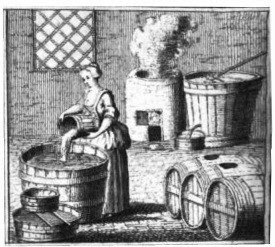 The boiling to make beer neutralized most of tainted water’s ill effects, but this was long before anyone made the connection between boiling and sanitation. So people merrily went about the practice of drinking beer. Although the new world had a seemingly inexhaustible supply of pristine water, few if any would ever dream of drinking it. So it was that a brewhouse was an indispensable priority in each new settlement. Most parties landing on American soil would bring with them the equipment and raw materials to begin immediate production of ale. Pity the colonists who didn’t bring a brewer with them. Long suffering indeed were the first inhabitants of Jamestown, Virginia who had neglected to include a person skilled in this craft among their company. Their plight caused them to seek relief from England and they placed advertisements seeking “two brewers’ to join them. New York was a different story. Established by the Dutch, England took control in 1664 and found a network of canals which imitated the Dutch homeland. Manhattan island lacked an abundant supply of fresh water and even the brewers had difficulty obtaining enough water to produce adequate amounts for drinking. Surprisingly, despite all their canal digging, the Dutch had not sunk a single well in the village, a situation the new administrators soon remedied. As a resort, brewing rapidly expanded. Ale and beer was a major dietary staple in the colonies. Literally everyone partook. It was the common item which spanned generations, from cradle to grave everyone drank beer. Infantswere fed beer and it was especially recommended for nursing mothers. Farmers, laborers, merchants, lawyers, and craftsman all drank beer. It was a common thread in all their lives and this democratic beverage would even play a role of mid-wife in the formation of government. It was not uncommon for drinking to begin even before breakfast and it continued with every meal throughout the day. Seldom did anyone pass on the opportunity to down an ale. It was both the nourishment and refreshment common throughout that period’s long work days. The quintessential colonist Benjamin Franklin described his earliest job in a print shop with frequent reference to ale. As a young apprentice, tending to the needs of the journeymen was one of his foremost duties. A right to take a portion of one’s wages in ale was another custom these displaced Englishmen brought with them. Franklin’s diary repeatedly mentions the times his work was interrupted as he was dispatched to fetch rations of ale. Although this job resulted in his early disdain for the beverage he soon developed a fondness. Even John Adams, first United States ambassador to the court of St.James was a beer drinker. During the formative colonial years most of the brewing, and drinking was done in the home. Although the young villages would soon witness the establishment of commercial breweries it was in the home where most beer was produced. Until strains and methods for producing American barley were discovered most of the homebrewers obtained supplies imported from England. Hops, however were found growing wild and the transplanted Englishmen needed only a short walk in the forest to obtain them. Of course that would later change as demand far exceeded mother nature’s supply. This homebrewing even had its effect on colonial architecture. Most households added a small brew room onto their living quarters. The heat generated, and possible fires caused by the brewery/kitchen were in this way isolated from the remainder of the house. To this day those additions are clearly visible on the oldest American homes as a lower roof line jutting out from the main building. A majority of brewing remained in the home for another reason. There was essentially no monetary system in the colonies, a problem which continued well after independence. The lack of money stifled not just commercial production of beer, it retarded most economic development. It wasn’t until decades had passed, and a stream of exports to England brought hard currency to the colonies that breweries appeared. When they did, it was in a form once again borrowed from England. This outlet would in itself stimulate the economy, encourage trade, advance development of the legal system and establish new social customs. But its application in the new world would forever change the face of North America. The next installment investigates the English institution which revolutionized life in North America, and it was because of beer. 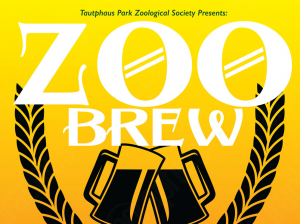 English colonists in North America had to brew their own beer. There was no other choice. If there was an opportunity to purchase a commercially produced beer it would be from a supply brought over from England. This was out of the question for most colonists, for there was little money available to make such a purchase. It wasn’t until the colonies began exporting goods back to England when beer sales rose to any significant level. It was iron, flour, and fur which brought in both beer and hard currency to North America. But even then both were usually restricted to the immediate area of coastal towns. Beer drinking within the interior was limited to homebrew supplemented by another transplant from England. Apple trees were not native to the new world but they grew well in the temperate climate. As the trees flourished households took to producing an acceptable alternative to beer, and the cider flowed. Indeed it was an early favorite among the settlers and would remain so into the beginning of the 19th century. Although it was both easy to produce and popular it was, after all, a substitute. For their first love, ale. As time passed the Royal Governors grew concerned over the lack of economic activity and development in the crown’s interior lands. Merchants might be content limiting trade to the coastal region but it was certainly no way to build and hold an empire. Something was needed which would encourage travel and trade to undeveloped, rural sections. They found the solution in English history. Centuries earlier trade in England was accelerated when it became easier for traders and merchants to travel, meet others, and conduct business in comfortable surroundings. This wasn’t supplied by any improvement in transport, it was through development of the venerated English tavern. Taverns provided a convenient place to stay when traveling and served as a focal point of trade. Thus people expanded the range of their business and taverns became centers of commerce. As a result tavern keepers were among the wealthiest members of any community. So well did this work in England it seemed only fitting to apply the same solution to the troubled economy of the Americas. Representatives of the crown soon directed each community open a tavern or inn to tend the needs of travelers. They knew such action would bring new inhabitants to the undeveloped areas and right they were. As taverns were built trade increased, and as trade brought in money more taverns were constructed. Even areas with little currency established taverns to function ascommercial centers in a barter system. There farmers could trade produce for a supply of ale. In some areas of southern colonies there was a set rate of exchange which dictated the amount of tobacco traded for a barrel of ale. Indeed the colonies could almost be thought of as existing on a beer based monetary system. The colonial administrators must have heartily congratulated themselves over the wisdom of their economic development plan. It was simple to implement, quick to show a return and required virtually no investment from England. If that weren’t enough the taverns also provided a side benefit not previously considered by the governors, but instrumental to implementing the policy of the crown. A system to administer law. There was a only a small budget for public works and government buildings in the colonies were virtually non-existent. Still, it was essential for any effective colony to be firmly rooted in the practice of English law. The method used to bring government to outlying areas was a system of traveling jurists. As they moved from town to town settling disputes and administering justice it became known as “riding the circuit” and the authority of the crown traveled with them. What better way to administer the law than in the center of a community and in a building which could be used with no expense. Thus taverns were used to hold the local court. It made riding the circuit a bit more appealing and further established the tavern as a center of any rural community. Overall it was another triumph for the Royal Governors. The role of the tavern as both a legal and commercial center had unparalled impact on colonial development. The growth and conduct of a region’s affairs were thus tied to the tavern and it was not long until it was also the social focus of a region. Travelers invariably brought news and through this system the colonials maintained contact with the mother country. All this activity increased the demand for commercially brewed beer. But as the number of taverns increased it became impractical to maintain a supply from England. Colonial breweries filled the void inhibited only by a lack of brewing’s raw materials. With time this too would change with barley fields and hopyards appearing throughout the colonies. As trade with England and the monetary system further developed taverns solidified their standing as a community center. No town of any size would be without one. Though the colonial administrators were pleased with the results events soon turned their opinion. In the next installment find how the crown’s officials soon came to regret the proliferation of taverns and tried to inhibit further growth. In early America a tavern was one of the most important buildings a community could have. It disseminated the news, served as the center for commerce, and filled the social needs of an often harsh existence. The colonial government found taverns so important to development of this new land they enacted laws to encourage their construction. Thanks to the nature of good New Englanders it wasn’t long until nearly every village had one. Indeed these were the motels, restaurants, and shopping malls of their day. Developed with private funds the taverns were used by a government short on capital funds. In fact they were in a manner of speaking used as an extension of government. In those days court wasn’t held in a set courthouse and the people didn’t come to the law, the law wIed over cases by “riding the circuit”, and one of the most famous of these early judges was Samuel Sewall. Coming into town Sewall did exactly as his peers. The first thing he looked for was the place all circuit riders held court, the tavern. Use of the tavern was a matter of practicality. More often than not the only communal building in an area was the local tavern. From the 1680’s on the tavern of John Turner hosted so many sessions of the Boston court that he actually designated one of the rooms as court chambers. In those times a barrister needn’t travel far to celebrate a successful case, the convenience was in the next room. Our friend Judge Sewall (who didn’t patronize taverns within Boston) was none the less often in the town’s ale-houses – he presided over many cases heard in the court chamber of George Monck’s tavern. This tradition of conducting a trial in the local watering hole continued for more than a century. Years after Sewall’s career the ever proper John Adams was himself riding the circuit and gladly visited many a tavern. He recorded his impressions of them for posterity but his ratings should be looked upon with skepticism judging by how many he described as “most genteel”. The first serious threat to the tavern business came as the 1700’s began and the cause of it all was a gesture of friendliness. As early as the mid 1650’s the government was alarmed by intemperance among its citizens. However, complete abstinence was never one of their goals; they just wanted to keep things under control. It was one of the new social drinking rituals which gave them no end of grief, the drinking of toasts. The custom began innocently enough, raising a glass to someone’s health was a means of promoting good spirit and a routine which gathered all together in a tavern’s main room. What better way to cement a new friendship than over a mug of foamy ale? Unfortunately, the government was given reason to believe things were getting out of hand. People were raising a mug to not only each others health but to the king, the queen, the royal offspring, the colonial governor, his spouse and offspring and on down to the royal dog catcher. It was all just becoming too much and something had to be done. The first laws in the 1640’s were largely ignored and it wasn’t until 1712 when the “Act Against Intemperance, Immorality and Prophaneness, and for Reformation of Manners” put some teeth into enforcement. In reality it wasn’t the act which raised a fuss, it was the conscientious acts of a dedicated law man, a lone protector who would attempt to extract order from the chaos. The night of February 6, 1714 was typical of mid winter Boston. Shops had long since closed and shuttered their windows. Even at an early hour the streets were relatively empty, but it didn’t mean everyone was asleep. A group had gathered in John Wallis’s tavern to commemorate the Queen’s birthday and as they began their festivities they anticipated the arrival of a distinguished guest, none other than a member of the Governor’s Council and esteemed Justice of the Superior Court. As he entered the tavern he was warmly greeted. The assembly raised their glasses to the queen’s health and then to his. Instead of pleasing this guest of honor they only succeeded in raising his ire. It seems they were violating one of the colony’s newest laws and the guest was not amused. Judge Samuel Sewall was angry. It was this “tavern disorder” which prompted the constable to call Sewall away from the warmth of his fire, and he quickly ordered the band of party’ers to disperse. Instead of following his directive the group stood their ground in protest. After more than an hour of heated debate they left the tavern, however any hope Sewall had of this being the end of the confrontation immediately evaporated. The merry-makers only moved the fun to one of their nearby home’s and after settling in called for the colonial equivalent of a beer to go. This defiance was more than Sewall was willing to overlook; it wasn’t long before he had the aid of his associate justice Edward Bromfield who threatened them with calling out the militia. Further they infuriated Sewall by jokingly spelling their names for his future use in court and compounding this by insisting the colonial government was incapable of passing Even “one good law”. Sewall would see they had their day in court. The conclusion should not be drawn that Sewall was against tipping a glass of beer. In fact, he was known to freelypartake of not only beer but also wine and cider. His journal recounts many evenings of hoisting a beer. He even owned a malt house, but the law was the law. This incident was one which serves to illustrate the paradox created by colonial law. There was no question the establishment of taverns was beneficial to commerce, but the authorities also saw the problem of people gathering and drinking. This was evident in Sewall’s conflict when the party insisted the government did not have even one good law. As sure as people may have gathered initially for social purpose the conversation inevitably turned to politics. It was the political discussions which made the Royal Governors’ nervous; it was questioning both the crown’s wisdom and authority. The answer was to outlaw the drinking of toasts but the intent was to inhibit what were becoming political gatherings. So although the government was encouraging the growth of taverns they concurrently enacted laws to discourage their use. Yes even then laws sometimes seemed to irrationally contradict each other. Officials of the Crown skillfully developed the interior sections of the North American continent through a variety of plans designed to stimulate economic growth. None of these enjoyed greater success than the encouragement of rural communities to open local taverns. The effectiveness was almost beyond what any of the governors could have hoped. The taverns eased the arduous travel of merchants, increased trade, provided a social outlet for the community, served as a distribution center for news, and brought the legal system to formerly isolated “backwoods” areas. Among the other benefits of having a tavern a community benefitted from its essential role in providing a means of common defense. In colonial times it was the ordinary citizenry which banded together into an armed force. The “militia” was in effect a volunteer army. In times of Indian raids or threats from French Canada the militia was called out to protect the frontier settlements. The problem with relying on a militia was inconsistency in both ability and experience of its members. Regular army officers unfortunate enough to be shuttled off to colonial posts viewed the militia ranks with skepticism at best and usually with scorn. However, with problems of its own back on the continent, the powers in London were reluctant to station a standing army of any size in the america’s. Thus it was up to the colonists to provide their own defense. The plan seemed simple enough, except that when faced with a choice, most militia members avoided the supposedly mandatory training days. Service in the militia didn’t pay, so why go drill. The attitude seemed to be an unspoken “Well of course I’ll take this serious…when I’m faced with certain death.” This was exactly the attitude which nearly drove regular officers mad. An army is ineffective and subject to slaughter if it cannot maneuver with speed and discipline in the field. Neither pleas nor demands to the royal governors could bring about satisfactory conditions. The frontier farmers and traders simply wouldn’t show up for training. Finally, the administrators turned to a solution which successfully solved other colonial problems – – beer. Need to turn out the population of a region? Easy, underwrite a few barrels of beer at the local tavern. It was an immediate success. Able bodied “militiamen” literally appeared out of the colonial woodwork. It was amazing what an effect a little free ale could inspire. With the aid of free ale it wasn’t long until “Drill Day” became a not to be missed social function of the North American frontier. The long days of hard work carving a farm out of wilderness meant isolation and the chance to meet neighbors in arelatively relaxing setting, with free beer, was too much to pass up. Soon the wives and families wanted in on the event and people started to show up early in order to pursue a little extra socializing before the drill. Beer flowed freely, sometimes to the detriment of the next day’s drill. Thus, despite initial success in calling out the volunteers to drill, officers of the regular army were once again driven back to near insanity. Was this throng uncontrollable? Eventually they came upon a solution, don’t release the free beer until the training was complete. In New York a particularly well conducted drill so pleased Governor Crosby he expressed his gratitude by purchasing 12 barrels of ale for the troops. While this provided a bit of a remedy, a larger problem was brewing. The citizen soldiers were learning a few things. First, they could function on their own. Second, the militia junior officers were learning to command. They were also learning to both assemble and operate as a unit out of a central point, the tavern. No coincidence the earliest organized protest to English rule came from the tavern room. It was were political dissent was born and from which the activity of disobedience to the crown originated. Indeed, it was from a tavern that a mob spilled to provoke the Boston’s British garrison into what became known as “the Boston Massacre”. Fortunately for the garrison, beer drinker John Adams successfully defended their actions in the trial which followed. Later, John’s cousin, and revolutionary protagonist, Samuel Adams, directed another group reinforced with the liquid courage of beer. From a planning and command post in Boston’s Green Dragon Tavern they launched a protest to taxes which became known as “Boston Tea Party”. Their attack on British cargo ships was in the thin disguise of Indians, and once at the docks they ransacked the tea, throwing it overboard. Such disregard for property, at the hands of an organized mob, pushed the crown to the limits of its tolerance and set the stage for military action. When the two sides met in Lexington, Massachusetts the opening of hostilities took place in exactly the fashion in which the militia was trained. Their leader Captain Parker established his headquarters in the nearby Buckman Tavern. Thus part of the solution to development of the colonies, by encouraging the growth of taverns, eventually led to the end of British colonial America.